LinkedIn’s functionality and capability has changed over the years and perhaps that is why you’ll find varying pieces of advice and wisdom. More and more, savvy recruiters and employers are using LinkedIn to search for the right talent. Will you be found? Here are 12 tips to building a better LinkedIn profile. Having a clear, professional, friendly looking picture of you (and you alone) is expected. In fact, most profiles do have photos, so when I see a profile without one, my immediate and lasting impression is…why doesn’t this person have a picture, for crying out loud? Really, is that the impression you want to leave? Here are some interesting stats on why you should have a photo. By default LinkedIn will use your most recent job title for you professional headline. If that is not the job title you want to be known for, then edit your profile. This is one of the first things a visitor will see, so if the message isn’t clear or exactly right, you could lose them. For examples of enticing headlines, check out these. Your summary, much like the summary on the back of a book jacket, is what compels people to read more and take interest. In the olden days, it was acceptable to have a cut and paste version of the summary from your resume. But in reality, LinkedIn is a social network and people want to know you a little deeper. I see more and more summaries written in the first person, “I value..” “My lifelong dream…” . This makes it more personal. I am not suggesting it get too personal, just real enough so your true personality shines through. Employers and recruiters are masters of search. They know the key words they are looking for. Do you use key words in your summary? Have you added Specialties? You should know what the right key words are for your industry and occupation. These are typically the specific skills required in job postings, and no, I am not talking about “hard-working”, “dedicated”, “trustworthy”. I am talking about software, terms and industry knowledge. Get familiar with this and begin to immediately incorporate them into your summary. If you don’t use them…you don’t have them. What is that, you may ask? Whenever you make changes to your profile (any change) every one of your contacts is notified. If you are in stealth job search, you don’t want to tip off your network as you make changes. It is unfortunate, but all too often true, that people don’t update their LinkedIn profile until they are ready to search. You can stop these activity broadcasts by changing your settings. Pssst: if you are already an active user of LinkedIn add people to your connections and regularly update your profile, this may not send any red flags. *CLARIFICATION: Yes, you do want to ping your connections but with the right pings. 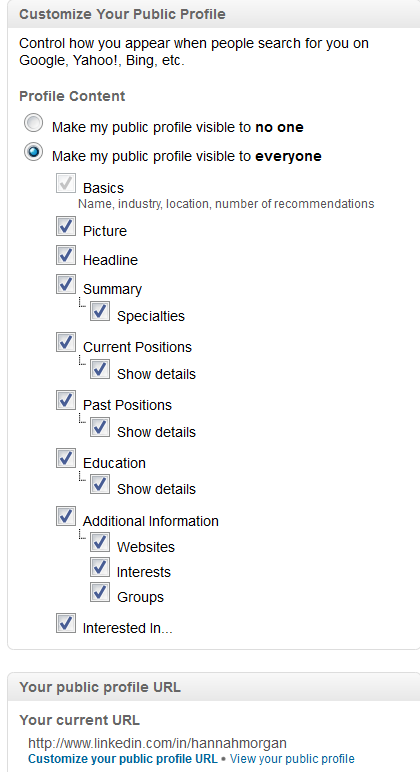 Tons of updates to your profile all of a sudden is a sure sign you are looking for a new job. Once you have made edits to your profile, turn this notification BACK ON! Your status pings your connections in their Network activity. This can be a super way to increase your networks awareness of you. It is also a great way to begin building your personal reputation. Examples of things to update your status with? An event you will be attending- including the link; a great article about your industry or occupation; good news about your company, you or a colleague; recommendation of a book; anything that shows you are professionally committed. If you have only listed your work email, you will absolutely want to include your personal emails as well. What happens if you are unexpectedly asked to leave your employer? You no longer have access to your work email and therefore, lose access to your LinkedIn profile. While this can be fixed, it takes a bit of work on your part, so be smart and include your other email addresses. Additionally, this helps people connect with you. LinkedIn recognizes you by your email, so if someone sends you an email to connect via LinkedIn to your personal email address and you haven’t listed it within your profile, LinkedIn doesn’t know you have a profile and this frequently results in duplicate profiles. If you haven’t started including a link to your LinkedIn public profile, you should. Put it on your resume, your business cards and use it in your email signature. But before you do this, customize the URL so it just includes your name. It looks more professional. You want to be visible. You want people to know if you’ve looked at their profile. Can you stop using “anonymous LinkedIn user”! And really, why don’t you want me to know your last name? If you will be searching for new employment or are seeking employment, open up your profile and let people see who you are. Showcase examples of your work using Slideshare or Box files. Maybe you have customer testimonials or letters of recommendation that you want to show off. Create a presentation or scan the letter into Box for everyone to have access to. I use them on my profile. I wrote about using LinkedIn’s apps in this post: Make your LinkedIn richer by embedding media. Tip 11: Website links? Customize those too! You can’t be sure they will tip the scales in your favor, but you shouldn’t discount them either. Give to get is the motto. Write a recommendation for a colleague, partner, vendor, manager… someone you worked with and genuinely would like to share your appreciation towards. I really wanted this to be called, how to build a better mouse trap…because you want your profile to “catch” the viewer’s attention…. Any other suggestions you would make? If you aren’t familiar with Jason Alba’s book, videos and blog: “I’m On LinkedIn…Now What?“, he provides great insight and help! If you are looking for other resources and help with LinkedIn, you can see some of the many resources for social tools on my Resources page (including LinkedIn). Any other tips you would like to suggest?